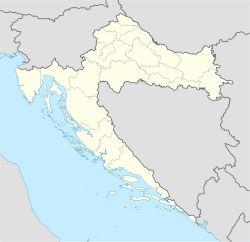 Nickname(s): "Pearl o the Adriatic", "Thesaurum mundi"
Dubrovnik (Croatian pronunciation: [ˈdǔbroːʋniːk]) (Italian: Ragusa), is a Croatian ceety on the Adriatic Sea coast poseetioned at the terminal end o the Isthmus o Dubrovnik. It is ane o the maist prominent tourist destinations on the Adriatic, a seaport an the centre o Dubrovnik-Neretva coonty. Its population wis 43,770 in 2001, doun frae 49,728 in 1991. In 1979, the ceety o Dubrovnik jyned the UNESCO leet o Warld Heritage Steids. The prosperity o the ceety o Dubrovnik haes aaways been based on maritime trade. In the Middle Ages, as the Republic o Ragusa, an aa kent as Maritime Republic (thegither wi Amalfi, Pisa, Genoa, Venice an ither ceeties), it becam the anerlie eastren Adriatic ceety-state tae rival Venice. Supportit bi its walth an skilled diplomacy, the ceety achieved a remarkable level o development, parteecularly durin the 15t an 16t centuries. Awbeit demilitarised in the 1970s wi the intent o foriver protectin it frae war devastation, in 1991, efter the breakup o Yugoslavie, it wis besieged bi Serb-Montenegrin forces for 7 months an hivily damaged bi shellin. In Croatian, the ceety is kent as Dubrovnik; in Italian as Ragusa, an its historical name in Greek is Raiyia (Ραυγια) or Ragousa (Ραγουσα). The current Croatian name wis offeecially adoptit in 1918 efter the faw o Austrick–Hungary. It is an aa referred tae as Dubrovnik in the first offeecial document o the treaty wi the Bosnian Ban Kulin. ↑ "Population by ethnicity, by towns/municipalities, census 2001". Crostat - Croatia Central Bureau of Statistics. 2001. Archived frae the oreeginal on 2008-12-03. Retrieved 2010-02-15. ↑ "Encyclopedia, Dubrovnik". A&E Television Networks, History.com. Funk & Wagnalls' New Encyclopedia. World Almanac Education Group. Archived frae the oreeginal on 2010-02-14. Retrieved 2010-02-14. Wikimedia Commons haes media relatit tae Dubrovnik.